This past May 1st, across the United States and here in Quebec, the spirit of May Day was alive and well. 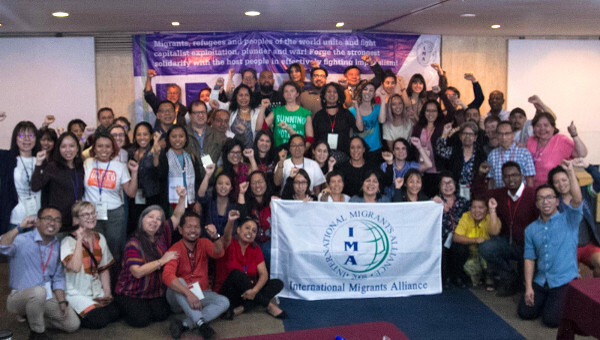 Immigrant workers have given International Workers’ Day a new breath of fresh air since the historic mobilizations of a “day without an immigrant” in the United States in 2006. This year in the U.S., broad coalitions of migrant communities and trade unions took to the streets in solidarity with immigrant workers to resist Donald Trump’s racist and xenophobic policies. In Montreal the Immigrant Workers Centre, community organizations, and trade unions marched in solidarity with precarious immigrant workers and the “Fight for $15” campaign. The struggles of immigrant workers for migrant justice, against racism and broad workplace struggles that impact heavily immigrant workers for decent work and wages are critical for any renewal of working class politics in North America and beyond. 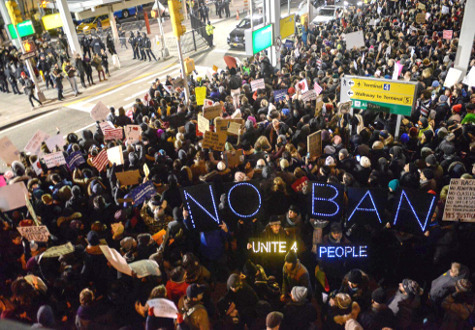 Protest at New York’s JFK airport, opposed to Trump’s ban. on immigrants from seven majority-Muslim countries, pushing forward the expansion of the wall between Mexico and the United States, and increased deportations. Migration has become one of the most profound issues of our time, shaping contemporary politics in the advanced capitalist states in Europe and North America. Not only in the United States, but in the first two months of 2017, 1,134 migrants crossed from the U.S. into Canada in harsh conditions in order to claim refugee status as a result of the crackdown on migrants in the USA. It is critical for the Left to put forward a clear position of solidarity with migrants and open borders at this juncture, not only in order to pose a challenge to the far right’s xenophobic agenda but also for building a working class movement for more radical social transformation. Across the advanced capitalist states, a few sections of the broad left have currently taken positions on migration based on a game of catch-up to the right. These policies have unfortunately begun to have a significant impact on how the Left is analyzing the question of migration, as well more broadly for how it relates to the questions of class and to whom we should begin to re-orient our discourse in this current moment of disorientation. Some sections of the Left seek to rebuild a lost connection to the “rust belt” working class, in particular states in the U.S., and de-industrialized regions in Canada, abandoned by the Left, thus rebuilding the weakening power of trade unions. 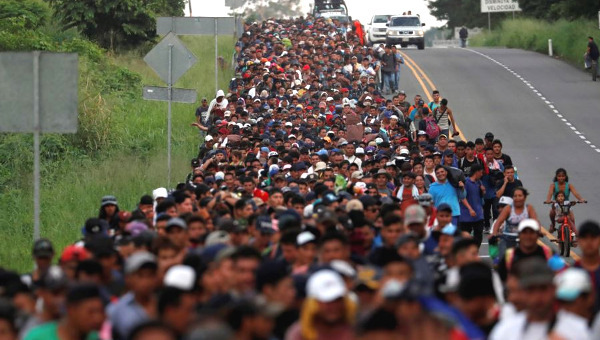 As a result, the strategy of this section of the Left has been to present a more tame position of regulated migration, in order to reorient their demands toward such sections of the working class. Similarly, elements of the trade union movement seek a tightening of the labour market through restricting migration rather than organizing migrants and immigrant workers, due to their own inability to adapt their organizing strategies and forms to the current historical juncture. This only reinforces a false vision that pits migrants and immigrants against a narrow vision of the working class. Such a view of the working class distorts our perception of how work has transformed, and of who is performing that work. To simply speak of a national working class is impossible; we need to think of the class in a true internationalist and local way, understanding the role migration plays. It is precisely at this moment that we need to be organizing more with immigrant and migrant workers, not simply to rebuild the labour movement, but more profoundly to create working class politics that can lead to radical transformation. To engage in organizing that can bring about solidarity in local communities to defend their neighbors; coworkers who face exploitation and deportation as a manner to frame how work has shifted. Why is there such profound migration, and how can they challenge their employers and racist policies by finding the local commonalities. The massive wave of migration over recent years has its roots in the dispossession of people by the devastating impacts caused by global capitalism, and U.S. imperialism, which have their roots here in the Global North. A testament to this is the recent ban of migrants from seven states that the U.S. has actively attempted to destabilize, force regime change, or has occupied directly. Canada’s role as an imperialist state has also fueled the destabilization of the Middle East, has contributed immensely to the creation of 60 million refugees by 2015 – mainly displaced in Afghanistan, Syria, Iraq, Yemen, and Somalia. The U.S. is also pursuing the same strategy to shut the borders to Latin America, in particular to those devastated by NAFTA and displaced from their lands as a result of U.S. intervention in Central America. Those that have become en masse displaced by U.S. imperialism and neoliberalism will have no refuge from its carnage. From the dangerous journey to “El Norte” to the death boats on the Mediterranean, migration has become the last desperate scream of humanity searching for a better future, making our solidarity and the opening of borders a must for the global working class. Global migration has reached historic proportions, reaching 244 million people in 2015, according to the United Nations. The massive wave of migration by 2015 was a signal in terms of both the desperation of a global working class and the increasing inequalities produced by the expansion of global capital, as those whose collective wealth and resources have continued to be drained, accumulated and concentrated. A recent study has shown that from 1980 up to the present, the developing world has lost $16.3-trillion in capital flight to the Global North. Developing countries have paid $4.2-trillion in interest payments on international debt. This has resulted in those populations without state social services, decent work, as a result of structural adjustment, and the integration into global capitalism. The integration of the developing world into U.S.-led global capitalism did not lead to a trickle-down effect of wealth and prosperity on a global level, but has in reverse led to a profound trickle-up effect – and concentration of capital in particular states and regions across the globe. As capital becomes more mobile and seeks competitive advantage, this has had a great impact on local populations. As capital flight generates unemployment and forces workers to migrate to seek work, at the same time generates the needs for workers in other regions. One of the largest flow of migration globally has been internal migration in China from rural regions into industrial hubs. Asia has also now become the second largest destination of migrants globally outside of Europe. As production chains become more global as a result of the compression of time to be able to move goods across the globe, has resulted in the need for greater low wage disposable workers in other regions. Shifting the nature of migration globally, already coupled with historical imbalances as a result of imperialism and uneven development maintaining particular migration corridors. The crisis of 2007/08 in the core countries resulted in push factors of new corridors such as African migration toward Brazil, and Asia. Thus as the power of capital globally strengthens and becomes more mobile it makes migration one of the major forms that workers have individually to cope with such capital flight, and uneven development under capitalism. Is Global Migration Necessary for Global Capitalism? One faulty assumption is that capitalists and conservative politicians are outright anti-migration. Trump had actually declared that his aim was to transform the U.S. immigration system into one modeled on Canada’s immigration system, which is based on meeting the needs of capital and ensures that those who come through regulated means remain temporary, vulnerable and deportable at any given moment. Global elites, and states in the Global North have in fact been immensely supportive of global migration that suits the needs of capital. Migration has not only provided mass pools of cheap exploitable labour across the globe but has also shored up entire economies in the Global South. In essence it has become the last escape valve that has prolonged the crisis in the Global South, through large financial flows from migrants in the form of remittances. Labour migration is the largest percentage of migration globally. According to the ILO, there are an estimated 150 million migrant workers in 2015 worldwide. The overwhelming majority of labour migration takes place in the form of migrant worker programs, either under trade agreements, through the International Organization of Migration, or Guest Worker programs. These migration regimes allow for mass, temporary migration that suits the need of capital rather than workers. States have increasingly opted for such models, based on temporary labour migration where workers are tied to a single employer without the freedom of movement. This can be seen as a globalization of the Kafala system. The Kafala system is a sponsor-based system of migration where the employer sponsors the migrant worker for the visa. This creates in essence a privatized form of migration where the employer has the power over the migrant to determine if they are allowed to remain in the host country. The kafala system is associated with temporary migrant workers in the Gulf Cooperation Countries, forcing workers into situations with single employer visas, without fundamental worker rights, and with deportation being the consequence of challenging their work conditions. This model is not simply a phenomenon in the Gulf, but has been expanded as a model of regulated migration globally. Canada has become an example of this system for other states to replicate – migration has become regulated and stratified in two forms: one for wealthier migrants, and skilled workers, who have access to citizenship and permanent residence under the point system; and the other form, extreme exploitation without the ability to become permanent residents under the Temporary Foreign Worker Program in Canada. The program has brought over 300,000 workers on temporary work visas without the right of permanent residency, tied to a single employer and thus constrained in their capacity to defend their basic rights for fear of facing deportation. This form of stratified migration is now upheld by the World Bank as an effective model to ensure continuing flow of remittances from the Global North to the South, while guaranteeing a supply of cheap labour that can be quickly accessed and disposed of. Ensuring that workers remain temporary in the countries to which they migrate ensures that they remit more to their countries of origin. 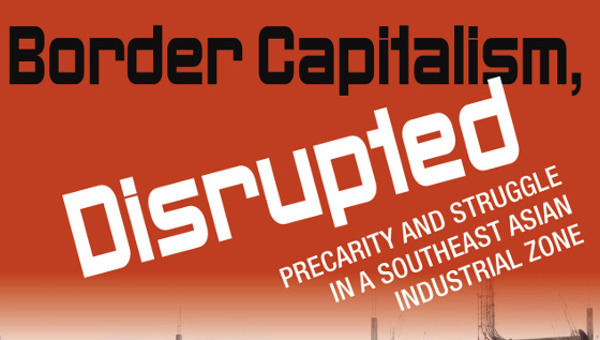 This has become a central aspect of capitalist development in the Global South. 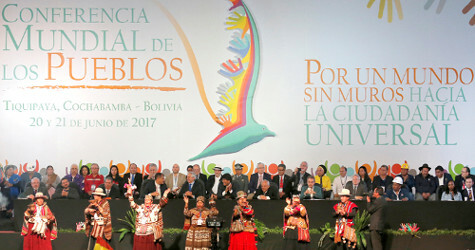 The failure of neoliberal policies (free trade, privatization, and freedom of movement for capital) in the Global South has led to a new discourse by the World Bank – promoting ideas of sustainable development aid; not eliminating debt and allowing countries to pursue sovereign forms of economic development, but repackaging neoliberal policies through aid. To no one’s surprise, the mantra of sustainable development also became an epic failure. The World Bank has since promoted what it sees as the only safety valve left to governments and capitalists in some zones of the Global South to release mounting pressure over unemployment, low value and low-paid work in global supply chains, and lack of state services as a result of economic restructuring – exporting, not commodities, but populations! Multi-lateral coordination between the UN, the EU, and the IMF through the Forum of Global Migration and Development, the World Bank has moved to promote and expand regulated migration as a mechanism for development, further locking certain zones in the Global South into exploitative neoliberal capitalism. By 2015, the remittances of migrants to developing countries had reached an estimated $601-billion. Without such remittances back to the Global South countries permitting them to purchase commodities from the Global North, they would not meet their international debt obligations, and people’s ability to survive would be in peril. Further, remittances and migration become the only means left for Global South populations to secure services, such as health and education, that were previously provided for publically but have now become privatized. Entire economies (such as that of the Philippines and Egypt) are now built around providing export labour. The Philippines, considered one of the great hopefuls of American-led globalization, although moving labour intensive industries to the Philippines has not improved conditions of poverty for workers there. This led to an increase of its labour export policy, which has led to sending 20 per cent of its workforce abroad. The Philippines has become dependent on remittances which account for 10 per cent of its GDP. Other states such as Egypt have pursued similar strategies, to shore up their economies. Egyptian migrants fill the fisheries of Greece, the agricultural sector in Cyprus, and construction in the Arab world. Egypt too was considered a darling of the World Bank with growth rates at 5 to 6 per cent during the early 2000s. Remittances from Egyptian migrants alone were equivalent to the revenue of the Suez canal, or 5 per cent of the GDP. Not only are the immediate remittances crucial for foreign currency reserves, but also for replacing state services such as welfare, and education, as those in poverty rely on remittances of family members who are sent as workers abroad. Remittances have become an increasingly important lifeline for developing countries. According to the World Bank, developing countries need to leverage remittances in order to gain access to international capital markets due to the counter cyclical nature of remittance flows. This has been the particular strategy proposed by World Bank economist Dilip Ratha. According to Ratha, “[r]emittances can improve a country’s creditworthiness and thereby enhance its access to international capital markets. Hard currency remittances, properly accounted, can significantly improve country risk rating.” This has only reinforced countries in the Global South to pursue labour export programs in order to have steady access to capital markets. This only benefits corporations in the Global North and South, instead of eliminating international debt, countries in the Global South can seek new loans to continue to pay their unjust debt obligations to international lenders. Labour migration has become a win-win for global capitalism – it has allowed countries in the Global South a mechanism to continue to integrate into global markets, avoid crisis, and maintain imports, but at the same time giving countries in the Global North unprecedented amounts of cheap exploitable labour. Beyond this, immigrant workers are concentrated in industries that cannot be off shored, such as: agriculture, food-processing, services, and logistics, where these workers face the same conditions as they would in the Global South. As conditions facing all workers become more precarious, immigrant and migrant workers become increasingly vulnerable facing lower-wages, precarious conditions, as temporary agency workers, as day labourers, and as a result of being undocumented and without having trade union representation. Despite this, they have organized against the odds, self-organizing against unjust laws, and employers. Organizing not only to defend their own labour rights, but for the working class as a whole. In the United States immigrant workers brought back to life a militant tradition to May Day as witnessed by the historic mass mobilizations, in 2006 on the “day without an immigrant” where a million people mobilized in the streets of Los Angeles and mobilizations across the United States. In France the sans papier actions in the Paris region in 2008 under the banner “we work here, we live here, we stay here” migrant workers organized wild cat strikes, and occupations of restaurants to demand regularization. In Canada immigrants have been central to broad based working class movements such as the fight for $15 in Canada. Migrant and immigrant workers have been forming new models of worker organizations along class lines, which has opened up the possibilities of going beyond business unionism. From the creation of hundreds of workers’ centres across the U.S. and in Canada, despite the contradictions and limits, migrant and immigrant workers continue to self-organize. Immigrants have formed their own unions on industrial lines, such as the New York Taxi Workers Alliance, taxi workers have organized in Toronto to build new types of organization, the Independent Workers Union of Great Britain which has organized migrant workers who are cleaners in London, and large networks such as the National Day Laborer Organizing Network in the USA. These examples of worker self-organization and a renewed labour movement by immigrant workers have been central to giving hope for a renewal of working-class politics. The industrial action by the New York Taxi Workers Alliance to refuse to go to JFK airport on the eve of the implementation of Trump’s first immigration ban despite the action being limited was the very first political industrial action by workers against Trump and his policies. This is the kind of struggle and organization that will rebuild the Left and where we need to concentrate our forces, if we truly want to move from protest to power. But that means a Left that takes a serious effort to relate to such struggles. Mostafa Henaway is a long time organizer at the Immigrant Workers Centre in Montreal, and was a member of the Ontario Coalition Against Poverty (OCAP), and the Toronto Coalition of Concerned Taxi Drivers. Mostafa Henaway is a Canadian-born Egyptian based in Montreal where he is a community organizer with the Immigrant Workers Centre. He is active with Tadamon! Montreal which works in solidarity with struggles for self-determination, equality, and justice in the Middle East and an end to Israeli Apartheid.